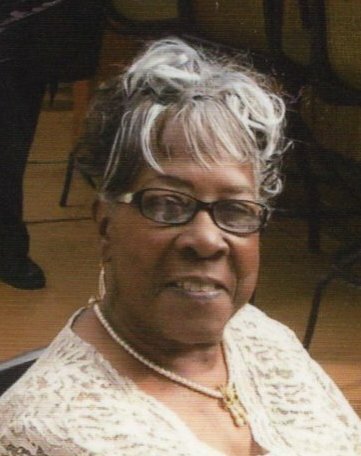 Shirley “Tot” D. Lemley, 78, of Fremont, OH passed away on Monday, November 26, 2018 at ProMedica Toledo Hospital. She was born on June 27, 1940 in Union, SC, the daughter of Samuel and Idella (Foster) Long. Shirley married James “Jimmy” L. Lemley on October 3, 1959 in Cleveland, OH and he preceded her in death on October 22, 2015. She worked at Stouffer’s in Cleveland; Dayton Marine and Peter Eckrich both in Fremont, OH. Shirley was a member of Victory Church. She was a foster parent and founded the Community Crusaders which was a grass roots prayer group/ after school program. Shirley enjoyed cooking, singing and spending time with her family. She would help anyone in need. Shirley is survived by her children, Veronica (Mike) Jenkins, Pamela (James) Kindle both of Fremont, Karen Lemley, Columbus, OH and James L. (Patty) Lemley, Jr., Wooster, OH; spiritual son, Pastor Darrell Gant; special great-great niece, Kelisha Sims; grandchildren, Balinda and Tyrone Lemley, DeAngelo Lee, Courtney Cote’ Lemley, Jamal and Nick Kindle; step-grandchildren, Joseph Jenkins and Ashley (Tom) Mathews; thirteen great grandchildren; brother, Charles “Peter” Long and a host of nieces, nephews and cousins. Visitation: Friday from 4:00 – 8:00 pm at Wonderly Horvath Hanes Funeral Home and Crematory, 425 E. State St, Fremont, OH. Service: Saturday, December 1, 2018, 10:00 am at Victory Church, with one hour of visitation prior to the service at church, 2051 Oak Harbor Rd, Fremont, OH. Pastor Scott Robles will officiate. Ms. Shirley’s Gracious and bright smile will be greatly missed. Family, you have my most sincere condolences. I know Shirley Dean is rejoicing, singing and shouting all around heaven. I love you all. Condolences on the loss of Mom Lemley, one of the kindest abd most loving ladyis I ever met. I used to talk to her, almost every week, when she came into the News-Messenger office with info on her Crusaders. She loved God and her family more than life itself. May God grant you peace and comfort at this most difficult of times. Mother Lemley was a soldier in the army of the Lord. She will be greatly missed! Memories all the way back to Greater St. James COGIC days…my condolences to the all of the family! Shirley was such a sweetheart and let me bend her ear many times. She always had a big smile and open arms waiting to embrace you whenever you had the pleasure to run into her. She was a shining light. Heaven definitely gained another beautiful angel. I can just see her and Granny dancing and praising the Lord! God bless you and yours. Prayers of healing and peace. Vern, my heart and prayers go out to you and your family. I know how loved and cherished she was. May she rest in Peace with God by her side. So sorry to hear… she was the nicest person there ever was. I am so glad I brought Mom to visit this past summer… We had such a nice visit. She will be missed dearly. Our Deepest Sympathy to the family from ours. Pam Kindle, my condolences on the loss of your lovely Mother. What a great blessing Sister Shirley was, and is to the family and community! Our prayers for peace for your families, as we know that she is with our Lord Jesus! Such a WONDERFUL and LOVING lady. I will, along with MANY others, will miss her smile and hugs. Shirley has been a friend of mine for a lot of years and I sincerely will miss her. Prayers to the family but know that there is absolutely no doubt she is sitting with, and probably loving on, the Angels. Rest in peace Aunt Shirley. You are forever in my heart, my friend. I will miss our prayer timed your WONDERFUL 7-up Cake! You were a wonderful woman of God, full of faith and love! You have left a precious legacy for your family to live by. I count it an honor to have known you and call you my friend. Until we meet again on Heaven’s shore. I am so sorry to hear of your mother’s passing. Thoughts and prayers are with you and your family during this difficult time. I will always remember her sweet potato pie and her friendship from Eckrich. May God comfort you. Ms. Shirley Lemley will be Deeply Missed by All! She loved So Many People, and They Loved her back. She had some special girls in her life and she loved them so much, As she would always say “I Love You, Yes I Does” my Heart will Never be the same, but I feel comfort in knowing I will see Her Again…. Humbly Submitted, The Bates Family…. Shirley will be Missed by Many, She came here with her Husband James many years ago and we have been Friends every since. She had a tried and True Friendship. She would give you the shirt off her back. She Loved my Children and their Children as if they were her own. We met in Cleveland and have been the Best of Friends every since. My Wife, Myself, and My Children will Forever Love and Miss her….Rest in Heaven until we meet again!!!! Auntie Tot. You are definitely going to be missed. I was sitting here remembering when we all use to come to Fremont for the family reunions. Auntie, I am so mad at myself for not coming to see you while you were still with us. The last time I saw you, you, uncle Jimmy, Peter and Pam was at mommy’s funeral. I love you auntie. You and Auntie Teenie always treated me so good. You and Teenie treated me better than my own family. I am so upset because I won’t be able to come and see you for the last time. Auntie, I don’t have a way to get there. Auntie, I want you to know that I love you so much. I am writing this with tears in my eyes. I miss you, Teenie, Uncle Jimmy, Uncle Dave, Uncle June and my daddy Freeman. Things were so much better when all of us were together. I even think about when I lived on linwood and uncle Dave lived in the building next to us. Auntie Teenie, Uncle June, Uncle Peter and Grandma Idella lived downstairs from me and mommy in the same building. Auntie, I am gonna miss you but at least I have memories. Thank you for loving me and not ever making a difference between me and my sisters and brother. You and Auntie Teenie loved me unconditionally and for that I will always be grateful. I love you now and forever. I will miss you Shirley. You were always a great Lover, wrapping your arms around everyone, and living out the Love of God. You never knew a stranger and your love for those kids and folks who others rejected was awesome!! Norma was also blessed to have you as a dear friend and companion and we were lucky to be included in your life and love too. May heaven bring you comfort and many rewards forever. You gave us all a taste of God’s presence, grace, mercy and unconditional love while here. Happily ever after forever. To the Lemley Family. I am sorry for your loss and know Shirley will be missed by family and friends. I hope this scripture bring some comfort at this time.